united states / mexico border station, 1925 - present: "came across the above photo by chance today. 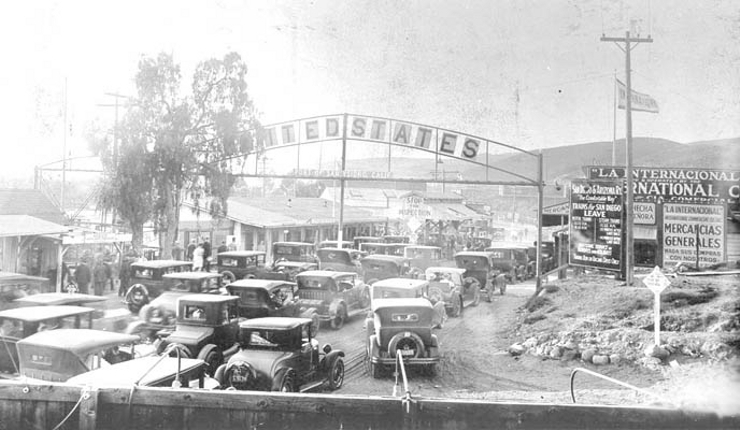 it's san ysidro border station in 1925, the same border station that is now the busiest on earth. although it looked fairly busy even in 1925 with 4 or 5 lanes of queueing cars, these days it has a whopping 24 lanes of northbound traffic for those travelling through from tijuana to san diego and another 6 southbound lanes for those going the other way. every day up to 50'000 vehicles pass through this gate, plus another 25'000 people on foot, and that's just into the united states. plus it's just about to be expanded.